To meet him, Kari Voutilainen is a very modest man. Low key, much like his much-heralded watches, which hold a special place amongst collectors, especially those who are patrons and supporters of independent watchmakers. His workshop does not make many watches, with production numbers reputed to be 40-50 pieces a year. There is no mistaking a Voutilainen watch, with their distinctive attributes of the case/ tear-drop lugs and of course his interpretation of Breguet hands. 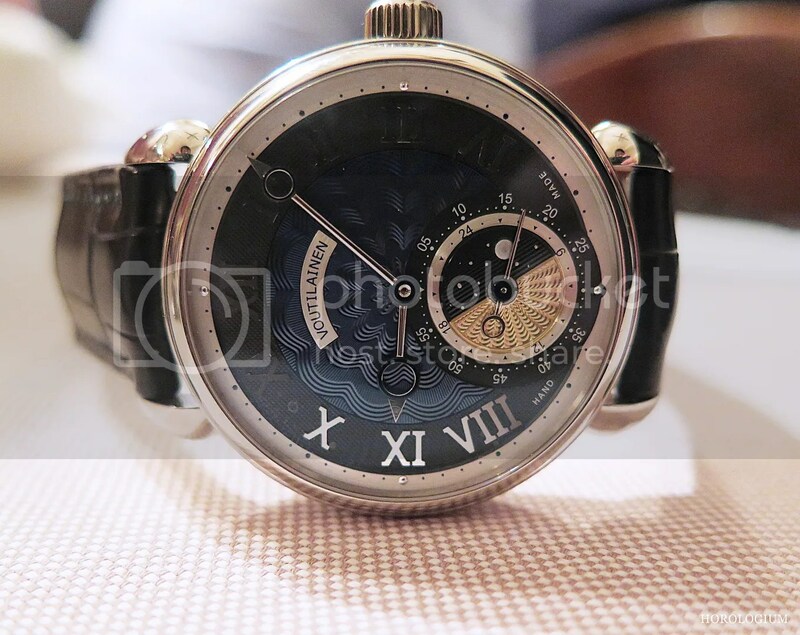 There are a number of owners of Voutilainen watches in Australia, but today’s post isn’t about one of the pieces owned by my friends, it is about the 39mm sized Vingt-8 GMT 6 with with blue guilloché dial that I had the opportunity to see when I crossed paths with Kari Voutilainen earlier this year. The GMT-6 has a movement that derives from the Vingt-8 model, but also featuring a GMT indicator at 6 o’clock. This function is realised via a rotating disc (revolving once every twenty-four hours) that shows a second time-zone and a day/ night indicator, and activated by depressing the crown; one press advances it by one hour. The new calibre has more than seventy new components when compared to the Vingt-8 movement and is not a module but an entirely new calibre. The movement uses a direct impulse escapement with two escapement wheels, which give direct impulse to the free sprung balance beating at 18,000VPH. Power reserve is 65 hours. The finish of the in-house movement is worth noting; the bridges with their frosting, hand-chamfered edges and hand polished screws balance wheel…it is very clean, with that renowned Voutilainen finishing. 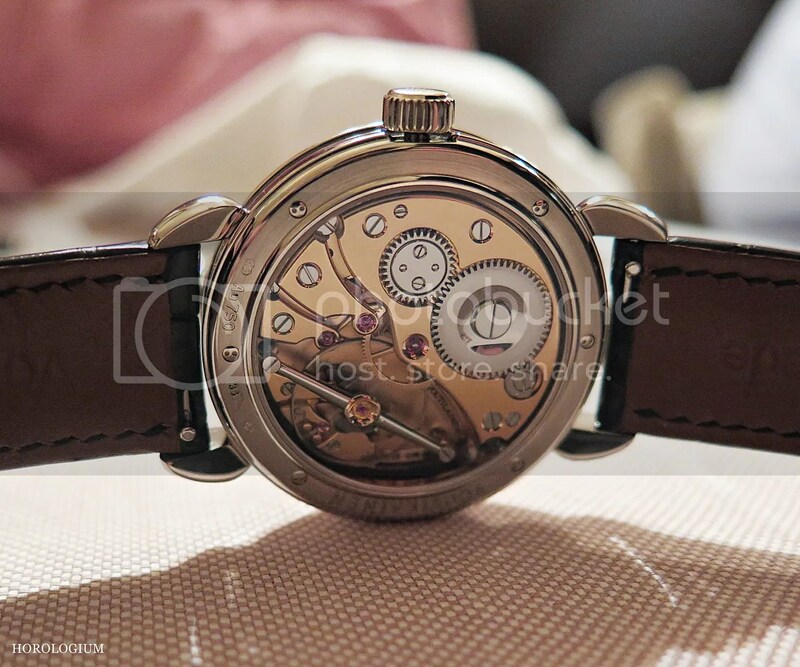 The Vingt-8 GMT has had various dials and decorations, including engine-turned and engraved, to cite two examples. This one is blue engine-turned guilloché. For those who don’t know, guilloché is a decorative technique in which a very precise, intricate and repetitive pattern is mechanically engraved via engine turning through the use of something called a rose engine lathe. If you ever have the good fortune to attend one of the major watch fairs, you may see someone demonstrating a rose engine lathe in one of the booths. One of the advantages of buying an independent watch such as this is the capacity for customisation, so if the dials you see on his website for this GMT aren’t exactly what you are looking for, you can always ask if some tweaks might be possible. 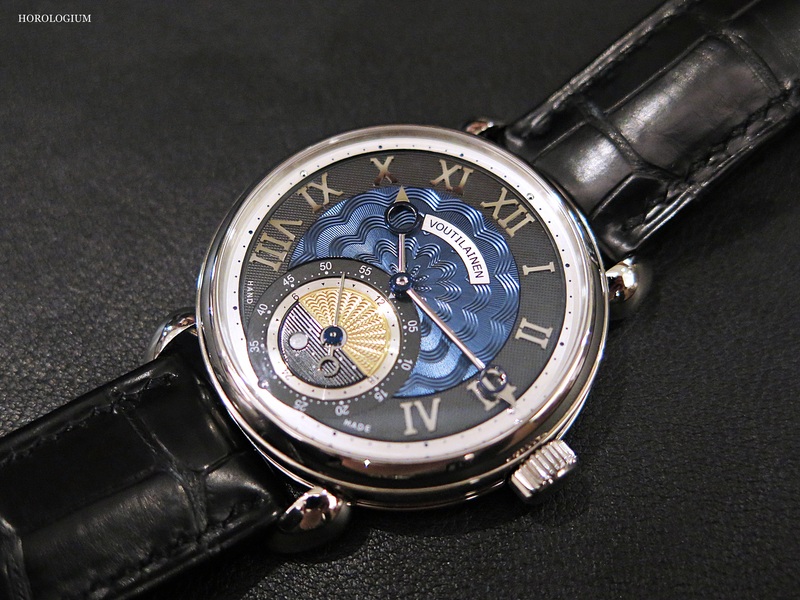 Oh, and you might also be able to pick your new watch up from KariVoutilainen himself.